Everyone loves a tropical getaway, and anyone can have one with the 22 Foot High Tropical Thrill Water Slide + Slip-N-Slide. The inflatable palm trees and rainbows that arch over the slide will give users the feeling of being in a lush paradise as they have fun in the water. Our 22 foot High Tropical Thrill Water Slide + Slip-N-Slide appeals to people of all ages with its bright colors and fun design. 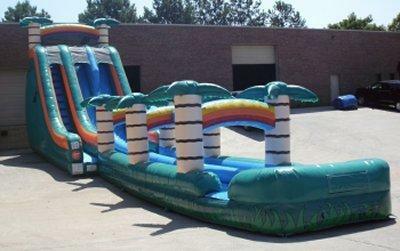 The slide is tall enough for older kids, and the nature theme and slip-n-slide portion is appealing to younger ones. Multiple kids can enjoy different parts of this unit at the same time, so it's perfect for parties and get togethers.